Episodes 1 - 4, 7 Produced and Directed by David Croft, Episodes 5 & 6 Produced by David Croft and Directed by David Croft and Robin Carr. Peggy recognises a deceased cat burglar in the newspaper as a former camper and when Ted finds out that a stolen necklace worth £10,000 may be hidden somewhere on the camp he arranges a midnight operation to try and discover where it is hidden. This operation means doping the campers and ransacking the chalets! Episode 2 : "It's Murder"
Mr Partidge is upsetting the campers and children with his drunken antics. He then goes missing, but where can he be.....? Episode 3 : "Who Killed Mr Partridge?" Ted and Spike finally discover that Mr Partridge is dead. They find him floating in the swimming pool with a knife in his back. But who is the murderer and are they still on the camp? Episode 4 : "Spaghetti Galore"
It is Gladys Pugh's birthday and she finds herself very much in demand, when both Clive and Harold Fox (The Smiling Viper) ask her out to dinner. She doesn't want to offend either of them. Help comes from an unexpected source when Peggy helps out with her motorbike. Spike finds himself not very popular with Yvonne when he tries out one of his new tricks on her. 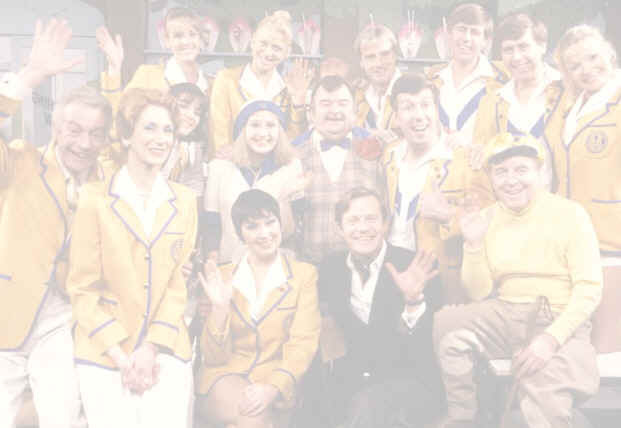 Episode 5 : "A Lack Of Punch"
Joe Maplin decides not to replace Mr Partridge and the staff are told that it is their duty to entertain the children. So Joe Maplins latest bit on the side, Poppy Maxwell writes some plays for the staff to perform. Barry and Yvonne are first with "Tuffet Tantrums". Then Ted and Spike spot an old tramp down on the beach entertaining the kids and their problem seems to be solved. Or does it? Episode 6 : "Ivory Castles In The Air"
Gladys is swept off her feet when Clive decides to take her to see his family estate, but Gladys has got the totally wrong idea about Clive's intention. Meanwhile the Yellowcoats have to take part in a competition to find out who is the Flurabrite couple of 1960. Peggy is over the moon to be chosen to be Miss Sanikill, the lavatory cleaner detergent! Episode 7 : "Man Trap"
Joe Maplin's press release angers it's subjects, Gladys and Spike, whose relationships with Clive and April respectively, looks set to suffer. Clive tries to use the situation as a way of getting rid of Gladys's unwanted romantic attentions.